Geneva / Nairobi / Mexico City / New York, 5 September 2012 - Coordinated action by governments and industry is urgently needed to reduce the growing risks to human health and the environment posed by the unsustainable management of chemicals worldwide, according to a new report by the United Nations Environment Programme (UNEP). UNEP’s Global Chemicals Outlook, released today, highlights the major economic burden caused by chemical hazards, particularly in developing countries. The release of the report – the first comprehensive assessment of its kind – follows renewed commitments by countries at the Rio+20 summit in June to prevent the illegal dumping of toxic wastes, develop safer alternatives to hazardous chemicals in products, and increase the recycling of waste, among other measures. “Communities worldwide – particularly those in emerging and developing countries – are increasingly dependent on chemical products, from fertilizers and petrochemicals to electronics and plastics, for economic development and improving livelihoods,” said UN Under-Secretary General and UNEP Executive Director, Achim Steiner. “But the gains that chemicals can provide must not come at the expense of human health and the environment. Pollution and disease related to the unsustainable use, production and disposal of chemicals can, in fact, hinder progress towards key development targets by affecting water supplies, food security, well-being or worker productivity. Reducing hazards and improving chemicals management – at all stages of the supply chain – is, thus, an essential component of the transition to a low carbon, resource efficient and inclusive Green Economy,” added Mr. Steiner. “The economic analysis presented in the Global Chemicals Outlook demonstrates that sound chemicals management is as valid an area as education, transport, infrastructure, direct health care services and other essential public services. This could foster the creation of many green, decent and healthy jobs and livelihoods for developed and developing countries,” said Dr. Maria Neira, WHO Director for Public Health and Environment. “Effective long-term management of chemicals and wastes lays the foundations for a thriving Green Economy, for ensuring a healthier environment, and for a fairer distribution of development benefits across society,” added Dr. Neira. In developing and emerging economies, products of the chemicals industry – such as dyes, detergents and adhesives among others – are rapidly replacing traditional plant, animal or ceramic-based products. This chemical ‘intensification’ of economies, as termed by the UNEP report, means that synthetic chemicals are fast becoming the largest constituents of waste streams and pollution around the world – thereby increasing the exposure of humans and habitats to chemical hazards. Over 3000 chemicals are classified under the EU harmonized classifications as toxic to aquatic life, with levels of toxicity ranging between “very toxic” to “toxic with long lasting harmful effects”. Run-off from fertilizers and pesticides is contributing to a growing number of oxygen-poor ‘dead zones’ in coastal waters. According to UNEP’s Global Environment Outlook 5, released in June 2012, only 13 of the world’s 169 coastal dead zones are recovering. As well as harming biodiversity, this can have a serious effect on fisheries – an important source of protein and livelihoods for millions of people worldwide. Poor management of chemicals is incurring multi-billion dollar costs worldwide – most of which are not borne by manufacturers or others along the supply chain, but instead by social welfare systems or individuals. This can increase the risk of industrial accidents, and the heavy financial and health burdens they bring. Costs incurred due to asbestos and contaminated drywall, for example, total over USD $125 billion worldwide – and the figure is still rising. Economic gains from implementing the country’s 2001-2020 national IPM programme are estimated to be equivalent to 3.65 per cent of Indonesia’s GDP in 2000. Predicted benefits over a 19-year-period include the avoidance of over 20,000 cases of acute poisonings among rice farmers, a total accumulated GDP gain equivalent to 22 per cent of Indonesia’s GDP in 2000, and an increase in household income by up to 5 per cent. 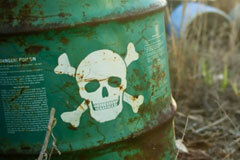 Better end-of-life chemicals management can also support the recovery of valuable materials from waste. This is particularly relevant to electronic waste (e-waste), which is recycled or dismantled for precious metals such as gold or copper – increasingly in developing countries. On the international level, the UNEP-hosted Strategic Approach to International Chemicals Management (SAICM) and the UN’s Hazardous Chemicals and Wastes Conventions provide regulatory and voluntary frameworks for promoting the sound management of chemicals. Many countries are already moving ahead with fresh approaches to chemicals. Brazil has established a National Commission on Chemical Safety to improve coordination among government agencies, while Costa Rica has also established a similar body. In Uganda, a UN-backed initiative has overseen the integration of chemical management priorities into the country’s Five Year National Development Plan. “From sustainable agriculture, to green buildings and waste management, sound chemicals management is an essential ingredient for almost all sectors in the transition towards a Green Economy,” said UNEP Executive Director, Achim Steiner. “This requires broad and ambitious efforts, underpinned by strategic financing. Such action can elevate chemicals management to the top of the international policy agenda and help deliver inclusive sustainable development,” added Mr. Steiner. The Strategic Approach to International Chemicals Management (SAICM) – to which UNEP provides the Secretariat – is a policy framework to promote chemical safety around the world. SAICM has as its overall objective the achievement of the sound management of chemicals throughout their life cycle so that, by 2020, chemicals are produced and used in ways that minimize significant adverse impacts on human health and the environment. This “2020 goal” was adopted by the World Summit on Sustainable Development in 2002 as part of the Johannesburg Plan of Implementation.